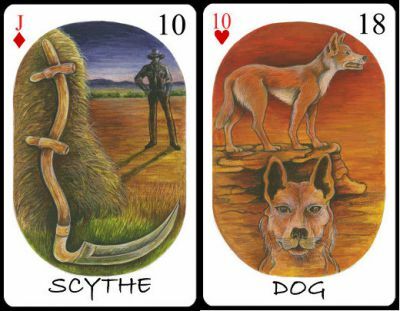 The Far Sight Lenormand is a pack of 36 cards designed and self-published by the Australian artist Helen Audrey Meinicke. The card designs were inspired by local fauna, flora and places. This is a limited edition of 75 packs and it includes 4 extra cards, a cotton batik pouch and a 44-page companion book. As a reminder of the “happy squirrel” found in some tarots, one of the extra card is the Ratatoskr, a squirrel who runs up and down the world tree Yggdrasil to carry messages. Cardmaker or editor: All packs are printed in Brisbane, Australia.